From left, City of Wilmington Safety/Service Director Brian Shidaker, Project Manager Paul Goodhue of the engineering firm LJB inc., LJB lead engineer Matt Gardner, Wilmington Street Department Superintendent Jerry Runk, and Safety/Service Coordinator Andrea Tacoronte discuss what they’d like to see or not see in a meeting about the upcoming Rombach Avenue project on Thursday. 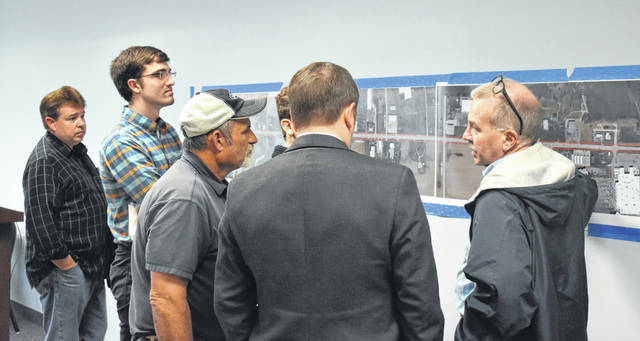 Locals talk with city officials about the upcoming Rombach Avenue project during a meeting on Thursday at the city building. WILMINGTON — “We want to hear from you” was the overall message at a public meeting at the Wilmington Municipal Building on Thursday afternoon on the upcoming Rombach Avenue street project. Shidaker told attendees they’re looking at everything from paving to pedestrian crossings to the traffic lights — which Shidaker indicated were outdated. “Everything is on the table,” said Shidaker. The project area stretches from First Financial Bank around College Street to the corporation limits around Starbuck and Wilson Roads, and would include East Side Drive. The project is set to start in March 2020 with LJB Inc. engineering firm helping. Currently they’re in the planning phase and want to get local feedback. Attendees were given a questionnaire to fill out and submit by April 12 in regards to what they like and dislike about Rombach Avenue currently, and what they’d like the city focus on. When asked to identify specific problems that Rombach has now, Shidaker highlighted two at the forum. “One is the condition of the pavement itself. It is aging, deteriorating, I don’t believe there’s been any major significant rehabilitation to the pavement in 15 or 20 years,” he said. The other item is safety, with additional focus on pedestrian safety. Shidaker hopes to hold another meeting soon in the evening, sometime before April 12. If citizens have questions about the meeting or the project, contact Shidaker at 937-382-6509 or email him at publicservice@wilmingtonoh.org.